STEP 1: Over medium-high heat, preheat a large soup pot with olive. Once heated, add the carrots, red onion, celery, ginger, and garlic. Reduce heat to medium and cook for 10 minutes, with the lid on to keep in the steam. Stir frequently. Health Tip: If you need more liquid, don’t add more oil. Add a splash of water. Keep a glass of water by the pot and keep adding water if needed. This will cut down the fat content. STEP 2: Add the vegetable stock and water to the pot. Turn up heat to high and bring to a boil. Reduce heat to medium-low once the liquid comes to a boil. Gently boil for 30 minutes. STEP 3: Turn off heat and add the tofu, honey, and spices. 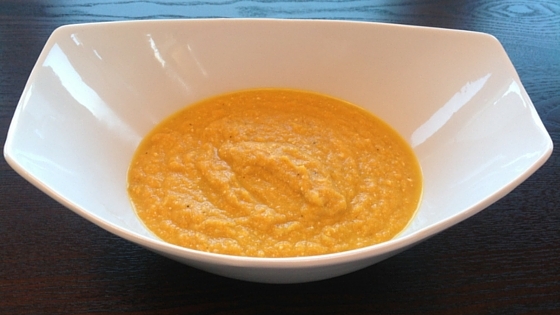 Using a handheld blender, blend the soup directly in the pot until it is smooth and creamy. If you are using a regular blender, you will have to blend it in batches. Be very careful with the hot liquid. Taste the soup after it is blended and add more spices if required. STEP 4: Pour soup into individual bowls and enjoy! You can add a sprinkle of Parmesan cheese if you want. This soup taste even better the next day. Time Saving Tip: A handheld blender is a great investment. You can blend your soups and other dishes right in the pot you are using instead of having to transfer it into the blender. I always use my handheld blender for creamy soups. Health Tip: The tofu gives it a really creamy consistency and a good dose of protein. I used tofu instead of heavy cream to keep the fat content down and for those who have intolerance to dairy.